Dr. Richard Sinda was born and raised in the Detroit area. While earning his Bachelor of Arts in Biology at Kalamazoo College in Michigan, he did two research internships at the National Institutes of Health in Bethesda, Maryland; one working with breast cancer (at the National Cancer Institute) and the other with optimal vitamin C levels (at the National Institute of Diabetes and Kidney Diseases). He went on to Des Moines University and graduated with a Doctor of Osteopathic Medicine, DO, degree 1991. Physicians of osteopathic medicine view a person’s body as an integrated system. He continued his medical internship and residency in Family Medicine in Detroit (affiliated with Michigan State) finishing in 1994. 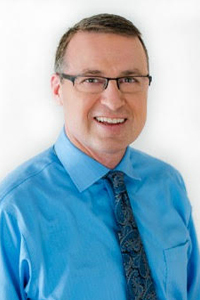 He has been board certified in Family Medicine since 1995. Dr. Sinda practiced Family Medicine for 8 years in Michigan and then in Minnesota while moonlighting in Urgent Care that entire time. In 2002, he switched to full time Urgent Care while also developing clinical content for medical software in Minneapolis. Dr. Sinda became certified in Age Management Medicine (AMM) in 2011 and joined Innovative Directions in Health practicing Preventive Medicine and Natural Bio-Identical Hormone Replacement. Our clinic protocols have a long track record of reducing hormonal symptoms and the risk of chronic diseases such as heart attack, stroke, dementia and cancer. In December of 2017, Dr. Rich Sinda was certified by the Institute for Functional Medicine as a Certified Practitioner. Functional medicine is aimed toward investigating the root cause of a disease and addresses the whole person, not just an isolated set of symptoms. Dr. Sinda applies these principles of Functional Medicine in his patient treatment plans. He spends time with his patients, listening to their histories and looking at the interactions among genetic, environmental, and lifestyle factors that can influence long-term health. He also continues to work in Urgent Care while focusing on prevention 4 days a week at Innovative Directions in Health. When he is not at work, Dr. Sinda enjoys spending time with his 3 sons, as well as playing guitar, running, traveling and reading about science and science fiction. He resides in Bloomington, MN.